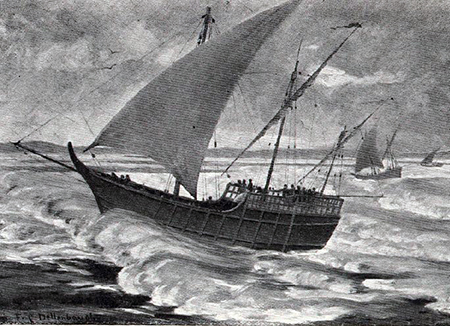 Alarcon's expedition sailed to the head of the Gulf of California and crossed the turbulent tidal bore at the mouth of the Colorado River. He navigated upstream in search of the land branch of the expedition led by Francisco Vazquez de Coronado and explored the waterway, which he named Rio de la Buena Guia or Good Guidance River as far as the Gila River confluence, near Yuma, Arizona. He was the first European that realized that the California was not an island but a peninsula. Having failed to make contact with Coronado's expedition, Alarcon left several letters at the foot of a lonely tree and sailed back to New Spain. The letters were found by an expedition sent to search for him. Fernando de Alarcon distinguished among other conquistadores because he treated the native people with diplomacy, and left unbiased chronicles about his observations on the Yuma Indians.